Developed by Tango Gameworks. Published by Bethesda. Released October 14, 2014. Available on PC, PS4 (reviewed), Xbox One. Copy provided by publisher. The Evil Within has been an exciting prospect among the recent resurgence of horror games. Riding high off the back of Alien: Isolation and striding on a foundation of independent scare fests, Shinji Mikami's return to the genre he helped codify has felt like something worth getting eager for. Unfortunately, for all its attempts at being a full-blooded survival horror game, The Evil Within suffers in execution, and isn't quite the bastion of terror it could have been. Things start off promisingly enough. Detective Sebastian Castellanos arrives at a psychiatric hospital, looking like Jaime Lannister and stumbling on the scene of a slaughter. After a brief investigation, however, Castellanos is captured by mysterious forces and finds himself at the mercy of a hulking, chainsaw-wielding maniac. The stealth-led introduction is nerve-wracking, and gives off a Nemesis-like vibe that makes for a particularly thrilling introduction. Then everything changes. To its credit, The Evil Within rarely plays the same gag twice. It starts as a thrilling game of cat-and-mouse, similar to Isolation or Outlast. After Castellanos escapes the hospital and ends up in a crashed ambulance out in the middle of nowhere, the game takes on a shape more reminiscent of Resident Evil 4. Crazed, warped villagers stumble through oddly rustic villages and forests, as players sneak, hide, and stab their way through these twisted human mockeries. The many boss battles that litter the experience are varied, and only occasionally feature repeat appearances from previously encountered monsters. There are chase sequences, action scenes, puzzles. Everything you've seen in survival horror since its inception is presented here, and celebrated. It's a fantastic endeavor, but unfortunately The Evil Within's focus on everything means it never feels specialized enough in any one area to fully realize its ideas. When I say the Resident Evil 4 sections feel exactly like Resident Evil 4, I mean they are just as old fashioned as Capcom's GameCube classic, complete with dated mechanics that ignore any third-person shooter improvements made in that time. Similarly, the stealth features are simplistic, and often suffer from creatures simply "knowing" when you're behind them. The combat, like in retro survival horror games, is inefficient and tricky, with low rates of fire and weapons that need a severe amount of upgrading to become effective - and yet there are many instances in which combat is necessary, and Sebastian is rubbish at it. 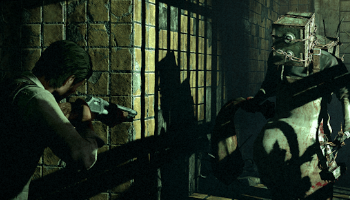 At times, The Evil Within comes off as simply mean-spirited in its interactions with the player. From instant-death traps that rely on trial-and-error surprise, to a sprinting meter that's pathetically small pre-upgrade and causes Castellanos to stop for breath even when chased by a lunatic with a chainsaw, the game's attempts to be difficult really stretch one's notion of fairness. It'll punish you for using resources and ammo you couldn't have predicted you'll need, it'll lock you into a pre-boss checkpoint with no way of healing, even if your health is so low that sprinting has become disabled (yeah, that happens). It introduces mechanics and new ideas quietly, not informing the player, waiting for them to replay tracts of game multiple times and dying until they get it. It's bad enough that Bethesda even knows it. Alongside my review copy of the game was a note asking that reviewers play on the Casual difficulty setting, not the standard Survival setting (I went with the standard, by the way). Not only that, but each copy came with a sealed envelope containing advice and obscure tips for every single level of the game. Due to embargo restrictions, I cannot repeat those tips, but they provide sometimes crucial insight that the game itself never communicates. It's clear that those presenting the game know it's either imbalanced or does a terrible job of interfacing with the player.